An average roof lasts between 20-25 years. The older a roof is, the weaker the materials and its structure become. 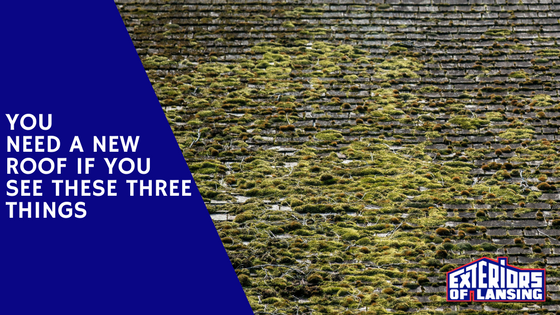 While there are many factors that play into how well your roof ages, if you know that your roof is more than 20 years old, it wouldn’t hurt to have it examined. Sometimes you can see that you need a new roof. If your shingles are buckling, curling, falling apart, or missing, this can be a good sign that a new roof is needed. Gutters full of shingle granules is another sign that your roof may be toward the end of its life expectancy. Granules are designed to protect the asphalt coating from UV rays and to add fire resistance. When they wear away, they can no longer do their job. It’s also important to check around your chimney, vents, pipes, and other things that come out of your roof. You want to make sure these seals are still intact and in good condition. Lastly, visible sagging in your roofline is a big warning sign that your roof is in need of repair or replacement. The most obvious sign of roofing problems is wet spots on your ceiling, or full-blown leaks in your roof. If you crawl in your attic and can see daylight coming in through the roof, it’s likely you’ll need a new roof. Moisture in your insulation is also a warning flag. If your roof is displaying any of these signs, don’t panic yet. While all these things mentioned are important and shouldn’t be taken lightly, they do not necessarily mean that you’ll need an entire new roof. In some cases, repair can add many years of life to a roof. It’s simply a matter of determining which route is the best way for you to invest your money into your home.